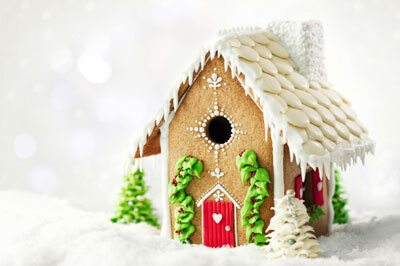 Making a gingerbread house is a Christmas activity that kids enjoy. This gingerbread is not for eating; it’s for construction. It’s edible, but therefore drier than gingerbread for eating. The recipe makes a large batch, so you’ll have some left over for trees or other shapes to add to the landscape. If you don’t have a 5-quart standing mixer, make it in two batches. Kids can help cut out the templates and the house pieces and, of course, can decorate the house. Cream the shortening in a mixer with the flat paddle attachment until it’s smooth. Add the sugar and beat on high speed until light and fluffy, about 4 minutes. Beat in the molasses until the mixture is smooth. Whisk the dry ingredients together and add to the mixer, 1 cup at a time, mixing until the dough comes together but is not dry. Turn the dough out onto a lightly floured surface, gather it together, and press it into a large, flat disc. Wrap it in plastic and refrigerate at least 2 hours, or until it’s firm enough to roll. Cut out the templates, following the diagrams; poster board or cardboard works well. To make this gingerbread house, you need one base piece, two sides, and two front/back pieces. Roll out the dough on a lightly floured piece of parchment paper to a 1/4-inch thickness. Use the templates to cut out the pieces from the dough. You may also cut out a small door shape from one of the ends. Save the piece that you cut out and bake it alongside on the sheet. Transfer the parchment paper, with the gingerbread on it, to the sheet pan. Bake about 12 minutes or until the gingerbread pieces have begun to color and are firm to the touch. 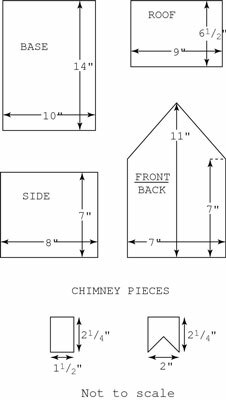 Remove the gingerbread from the oven and immediately place your templates back on top of the pieces and trim any protruding edges. Do this while the dough is warm. Cool on pans set on cooling racks. Repeat with the remaining dough; this will take you a few cycles depending on your oven size and how many pans you have. The pieces of gingerbread may lose their shape a little bit during baking, which is why you might need to trim them. If you wait until the pieces have cooled to trim them, they may crack. If the pieces have cooled and you really need to trim a piece, try a gentle sawing motion with a serrated knife. Make the mortar in two batches. For each batch, whip 4 egg whites in a mixer with the balloon whip attachment until frothy. Slowly add 4 cups of confectioners sugar and whip until thick and fluffy and stiff peaks form, at least 8 minutes. Add a little more sugar if too thin, or a little water if too thick. Place a damp towel over the bowl until you’re ready to use the mortar. Repeat with the remaining ingredients.